Our proposal is to make Rio Tercero in Córdoba province, a city with a population of 46000 people, the “First Dash-friendly pilot city”, based on a thorough training to traders, businessmen, entrepreneurs and the extended community. Large-scale promotion of the benefits of using Dash as an alternative payment method in daily commerce. ﻿Our scope is to reach about 5000 persons using TV, Radio FM, Local and Regional Newspaper interviews to immerse them into Dash community and activities over the time. Achievement of national development through large-scale events. Opening of at least 900 wallets throughout this period. Our main but not sole objective is to introduce Dash to the Argentine market. Argentina is a country that lacks sufficient knowledge as far ascryptocurrencies are concerned, and where these currencies, particularly the Bitcoin, are referred to in a speculative way. Thus, there is an advantageous and favorable environment for the arrival of Dash to our country as an alternative payment method. Our plan is to organize two events per month (a conference and a workshop) for a period of three months, in which participants will get Dash marketing material and credit to foster the use of Dash as an alternative payment method. We estimate an audience of 400 participants per month, a total of 1200 participants in the entire period. Conferences will deal with Blockchain, Cryptocurrencies, Dash Digital Money, focusing further on topics such as DAO, Masternodes and Dash mining. During workshops, participants will be able to experiment and naturalize the use of paper wallets, mobile wallets and exchange, providing an open platform for debate among participants on how to spread the use of Dash as an alternative payment method in daily commerce. Conference and Workshop driven by us. Also we plan to post a column during the previous week of each event in "Diario Río Tercero" - Daily Digital Newspapper, shared using whatsapp to almost 2500 subscribers. We are in touch and negotiating with the most important regional Weekly Tribuna Digital newspapper, to make the chronicles of each event. In TV sector, Río Tercero has two TV channels and we are in talks to insert a dialy tv spot with three news about cryptocurrencies in prime time. This strategy allows us to confirm that more than 5000 persons will be under "DASH EFFECT" and will be de begining the most important phase of comunication , that is to impose the topic will be DASH and Cryptocurrencies. Argentina is one of the two great South American economic powers, together with Brazil, and is going through a defining moment: with a population of 45 million people and a totally unstable currency, Argentinians are eager to look for new forms of investment, alternative payment and saving methods. So, this is the right time for Dash to present itself as a solution to financial problems with a great potential to prevail as an alternative payment system in Argentina. For the past few months, we have organized small Meetups with Dash wallet openings, events on Cryptocurrencies and Blockchain, promotion in local media, and we have done our best within our limited budget. These activities have allowed us to add a significant number of followers interested in Dash and its proposal as an alternative payment method. This has been possible partly due to our own funding and the invaluable funding received from our appreciated collaborator "JZA", principal mentor of the DASH GLOBAL proposal and member of the Dash Community of Mexico, to whom we want to thank for the support provided.This whole experience has helped us to consolidate knowledge and to position ourselves as local Dash referents; a reputation that we hope will increase in cooperation with this project.Likewise, we want to thank Wilmar Toro for his support for our Community of Dash News in Spanish, Eugenia Alcala from Dash Caracas Community, who motivated us with her tireless work in her country, and Alejandro Echeverria, the person in charge of Dash Help Venezuela, for his continuous guidance and advice. Coordinate with local Venezuelan community to let know DASH is available to repatriate fund to their families that were left living in Venezuela. Support and mentor for DASH massification. Re publish William Toro`s articles in our local site to promote DASH news. Provide William with information related activities that are being held in Argentina for Dash diffusion. Plus1Radio Project (Discord user katsupi#4601 - Russia). We encourage you to visit our website http://www.dashar.org﻿ for further information about our community, activities and proposal progress over the time. what exchange/s are you using to cash these gifted treasury dash into fiat to spend on your budget? 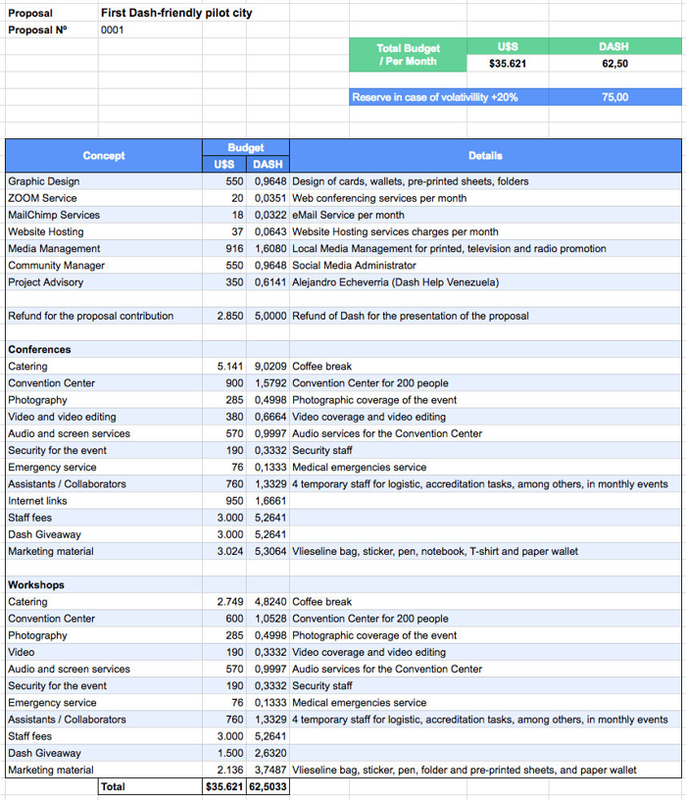 We are currently making P2P Dash sales to use the money to cover the costs of our Marketing and Events. Sorry for the delay in the answer. We are currently positioning the Dash Brand in the City using training events as a strategy to educate the city's shops and users. We are currently working on the development of a Broker service so that the user and merchant can buy Dash directly with Pesos Argentinos and at the same time merchants can sell their Dash and have Fiat money again. Dear MNos, we are glad to share with you out news and update for activities completed on April. We would like to thank you for your support and guidelines during this first experience. Please follow the link for the complete update an news we have published at Dash.org forum. voting YES. Argentina is an obvious target for Dash usage. I look forward to follow up reports on your work. Thanks for your support, we will do our best to share DASH experience to our people. As well we believe that the constant work will give huge opportunity to DASH in our country. About your question, The catering service is not limited to just only coffee, we will serve some snacks, finger food, non alcoholic drinks and some juices as well. Looking forward to seeing your progress, voting yes. @n00bkid , Thank you, we believe we will share a great experience. Yes. Thanks for the efforts! Thanks for trusting us, it's always a pleasure knowing that all the efforts and time are been recognized. Voting Yes.. Please keep up the good work! Thanks for your positive vote, we are nearer to reach the goal! I am glad to see a yellow bar on this one and hope it turns green soon. Best wishes on success with this proposal! 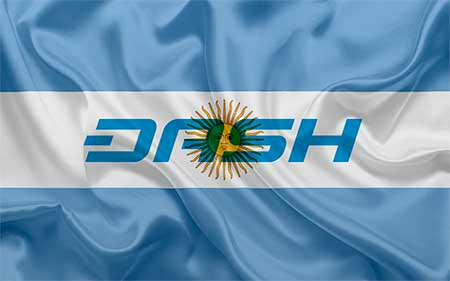 I hope to see more people from Argentina in the Dash community! Thank you for your positive comments and support, we are willing to achieve the milestone that allow us to develop our proposal. Dash Argentina is doing an amazing work there.They're very committed people spreading dash' knowledge in several places over the country, even through live online calls and also bringing local merchants to accept Dash in their business. 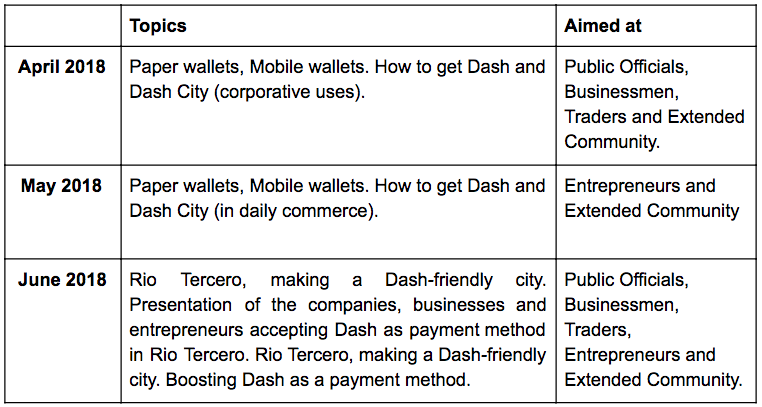 This proposal will help to increase Dash presence in South America. @Damian Walker: Dear Damian, we want to thank you for your words. We will keep working spreading dash experience around Argentina. As the first pilot experience of Dash intervention in Argentina, I find it interesting. @blockchaintech: Thank you for your confidence, we really appreciate your support. This is a big oportunity for Dash in Argentina because they are creating the first Dash community in that country. This is just the begining! Dash Help Venezuela will give online and call support for all those Dash users from Argentina. @alejandore Thank you very much for your words. As you know we are working really hard here. One of our main alliances has been defined to work together with Dash Help Venezuela in Argentina. @ec1warc1: Both are welcome to participate into the events. if you confirm that you are coming we can book you the hotel and we can pick you up in the airport. For any foreign participant if is interested in participate we will be glad to provide assistance too. Voted YES. - Muchos saludos desde Colombia! Will this be legal? Is it safe to do this with the strict currency regulations in Argentina? Or has that changed? Actually argentina is very crypto friendly, a lot of organizations including uber accepts crypto as payment. @JZA: Thank you very much JZA for your fast and accurate reply. I love the idea. Price is reasonable. Voting yes from Brazil. @dashuser33: Thanks for the support and confidence, we are really happy how this proposal has been received from you. So i think that this proposal must be voted, because this community is just created and they make a lot of work and we can see they want to work to develop Dash in their country. @carlomile3: Thanks for your support. We are truly involved to make it happen in our country. Voting Yes! This could be a model to follow. We will be monitoring progress if approved. @CRServers: You are always welcome to follow our proposal progress. We appreciate your time and hard work that will imply this task. For you to know, we will be documenting all the activities and publishing the lessons learned. We believe this experience will enrich the DASH community to improve the engagement in their projects. @crservers2: Latin America is an amazing place to began this kind of proposals, we believe that working all together can empower Dash all over the region. In fact our plan in a middle term is to share our experience developing a Dash-Friendly City to replicate it all over. looks superb and looks very professional, big Yes !! @dashmaximalist: We love to hear that all the effort made by us on this proposal has a great feedback from you. We are always open to receive any suggestion to improve it. These kinds of proposals are the foundation that user adoption and success are built upon. @thesingleton: We would like to thank you for taking your time to deeply read and understand our proposal. Hopefully, with your`s and others MNO`S support we will reach our first step to impose DASH as an alternative paying method in Argentina.